Our Queen Non Smoking is perfect for 2 people looking for comfortable accommodations with plush bedding. 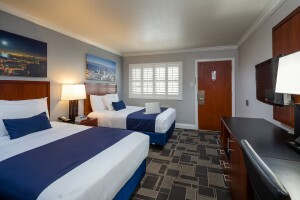 The room provides a desk with chair, private bathroom, alarm clock, and flat screen TV. We have a 24 Hour Cancellation Policy. If you wish to cancel or modify a reservation, you must do so by 3 PM 24 hours or 1 days prior to your arrival date. If you cancel or modify post the expiration of the Cancellation Period or you fail to show up, a no-show charge will be levied on your credit card for one full night plus taxes and fees. The name on the reservation much match the photo ID and credit card. Visa, MasterCard, American Express, Diners Club, Carte Blanche, Discover, JCB. This hotel reserves the right to pre-authorize credit cards prior to arrival. No Pre-pay Credit Cards, Gift Cards or Cash will be accepted. Credit cards are pre-authorized prior to arrival. The Hotel is not responsible for guaranteeing the reservation if an invalid or expired credit card is provided. The name on the credit card used to check-in to pay for incidentals must be the primary name on the guestroom reservation. Government issued photo identification and a credit card are required in order to check-in. A security deposit of USD $150 is required upon arrival for incidental charges. This deposit is fully refundable upon check-out and subject to a damage inspection of the accommodation. 10% Off for AAA or AARP Members. Must show membership ID at check-in to receive this discount. Accepted Payment Methods: Visa, MasterCard, American Express, Diners Club. This hotel reserves the right to pre-authorize credit cards prior to arrival. This property is privately owned and the management reserves the right to refuse service to anyone and will not be responsible for accidents or injury to guests or for loss of money, jewelry or valuables of any kind. Once checked in, no cancellations. All linens are inventoried: missing or damaged linens will be charged. NO PETS ALLOWED. Guest rooms that have evidence of pet dander and/or odor will be charged a non-refundable fee for deep cleaning services. Any damages to hotel property will be charged an additional fee upon assessment. This is a NON-SMOKING facility. Guest acknowledges that smoking is not allowed in guest room or within hotel facility. If anyone in guest's party smokes in the guest room, guest hereby expressly authorizes hotel management to charge credit card the amount to reimburse the property for the additional cost of cleaning guest room. Parking is Free and is Based on Availability. 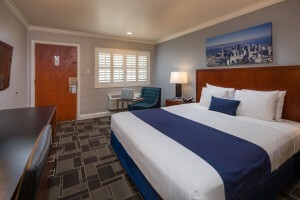 Parking is limited if NO PARKING is available on the property you can park on the street just remember The City of San Francisco has a very strict parking policies and The Bay Bridge inn will not be liable for any losses or tickets that is due to negligence. If you fail to adhere to these parking rules, your automobile may be towed and you will face a minimum $600 USD fine. 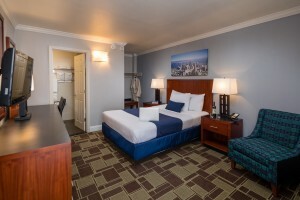 Our Single Queen Accessible Non Smoking room consists of a Queen size bed with plush bedding. This room is ideal for those in need of an accessible bathroom. Our King Non Smoking is perfect for 2 people looking for comfortable accommodations with plush bedding. 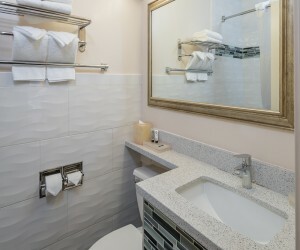 The room provides a desk with chair, private bathroom, alarm clock, and flat screen TV. Our Non Smoking Double Bed can easily accommodate up to 4 people in comfort. 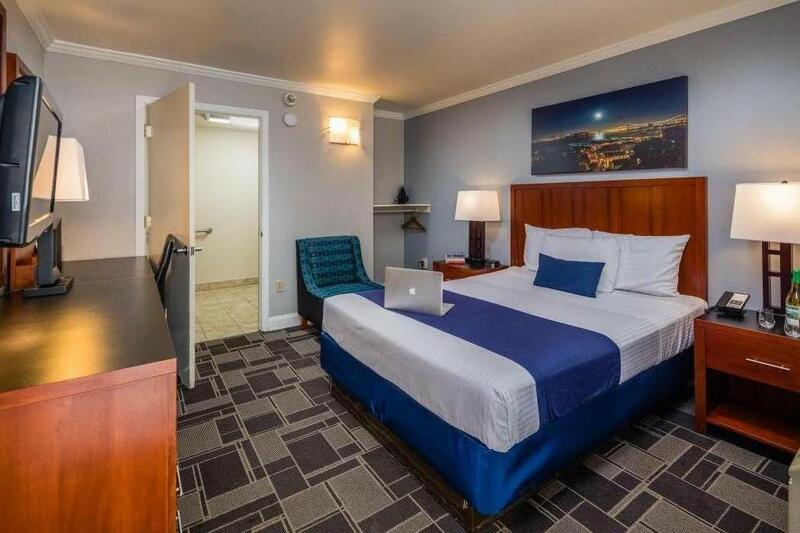 The room consists of a work desk and chair, flat screen TV, Alarm Clock, and a private bathroom.